Michigan has already been well represented on the ESPN150 and the Rivals250 and now they're done a great job at getting on the 247Sports list of the Top 247 recruits in the country. There are certainly some head-scratching rankings on the list, but Michigan did pretty well with a total of 13 commitments and two targets appearing on the list. This marks another list where Michigan's only 2013 quarterback commitment finds himself as the highest ranked commit for Michigan. He has been playing fantastic and actually won MVP honors at the Columbus Elite 11 camp where he earned a bid to play in the National Elite 11 competition. Another thing to note is that Morris is now the highest rated 4* on 247Sports' list, which means that if he stays where he is right now, the odds are really good that he will be given 5* status soon.At 6'3", 190 pounds, Shane Morris is primarily a pocket passer, although he has shown the ability to move around in the pocket if need be. Most analysts refer to Morris as having the strongest arm in his class. The only major concern I can see at this point is accuracy. Through the Elite 11 process, Morris has shown streaks of brilliance in delivering the ball on a string, but he needs to work on making that a consistent outcome. He has the arm strength to put the ball just about wherever he wants it. Other Notable Offers: Alabama, Cincinnati, Michigan State. 247Sports seems to really like Thomas more than most of the other sites. ESPN has him at #98 and Rivals has him at #95. I think a lot of the confusion surrounds Thomas and his position of choice. There was debate about which position would be best for him, which really makes him a hard recruit to gauge. He has only been playing in the secondary for a short time, which really makes me think he has amazing potential. He is probably the recruit that will have the biggest differences in ratings in Michigan's class, but that shouldn't worry fans, it's about the position, not his talent.Thomas's speed is not exceptional, but he does a tremendous job of making defenders miss and not going down on first contact. He could have a spot on the team at a number of positions with that kind of strength and instinct, including punt and kick returns. 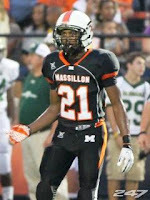 Other Notable Offers: Illinois, Iowa, Michigan State, Ohio State, Notre Dame. Kyle Bosch also received a big jump in this list. ESPN has him at #120 and Rivals has him at #77. I think he is probably overrated by 247, but he's certainly a talented player that will anchor a vicious 2013 offensive line recruiting class. He's gigantic and brings a tough attitude to his game, which gives him an advantage over the competition.Bosch, at 6'5" 285 pounds, depends heavily on his lower body strength, making upper body strength a personal point of attack before strapping on the winged helmet. He should be able to make a pretty significant impact once he arrives in Ann Arbor. Other Notable Offers: Alabama, Florida, Illinois, Michigan State. This ranking seems to be right in the middle of the pack. ESPN has him at #108 and Rivals has him at #57. Fox is an interesting player because his size can be pretty surprising. He stands at 6'6" and weighs 300 lbs, but his major advantage seems to be speed. That's pretty crazy for a linemen that already weighs 300 lbs in high school.There's little doubt that Fox will work to be an offensive tackle and fit in well with Michigan's other talented offensive line recruits like Bosch and LTT (listed below). His speed should be a major advantage for the running game and Fox should be a very reliable player once he arrives on campus, with the potential to play early, if the situation presents itself. Other Notable Offers: Iowa, Ohio State. Ah, the famous Tuley-Tillman, or LTT. He is an immense player at 6'7" and weighing 314 lbs. He is a very big guy and will no doubt be an anchor on the line. What's exciting is that the offensive tackles for Michigan in the future could be Fox and LTT, two huge offensive line prospects. Despite his impressive play, LTT is of course best known for his burning of an Ohio State recruiting letter. 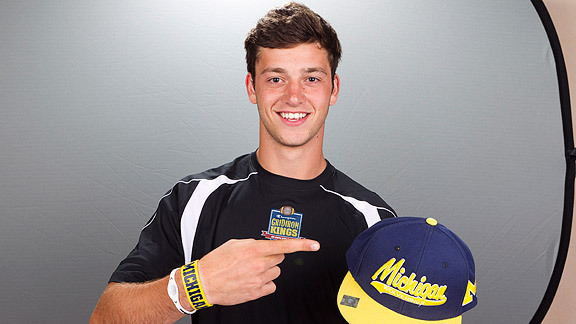 Whether you liked it or not, it has made LTT one of, if not, Michigan's most famous 2013 recruit. There will be a lot of talk about LTT in the future and there's no doubt that the letter situation will be mentioned before every game between Michigan and Ohio State when LTT is on campus. Other Notable Offers: Alabama, Arkansas, Florida State, Illinois, Iowa, Notre Dame, Ohio State, Oklahoma State, USC. Not only does Taco have perhaps the most awesome name in the entire recruiting class, he also brings an immense amount of talent to Ann Arbor. He is without a doubt an elite defensive end and has been blowing up at almost every camp he attends. He's a bit higher on this list than ESPN and Rivals, but don't let the numbers fool you, Taco is a very good pick-up for Michigan. Along with these factors, Taco is just one of many Ohio natives in this class that could have ended up going to Ohio State without Brady Hoke's ability to recruit out of the state of Ohio. 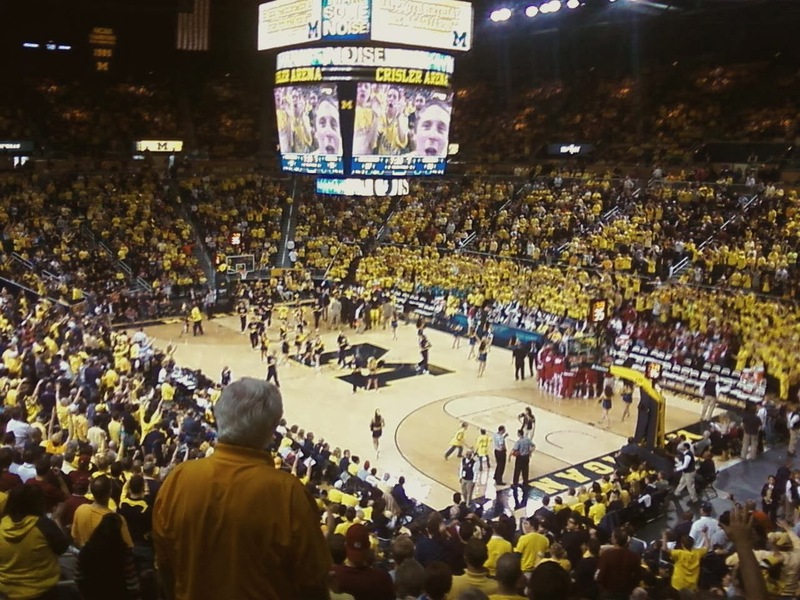 Hoke's ability to turn the tide in of the state of Ohio and in Pickerton High School, where Michigan basketball recruited Caris LeVert and Jae'sean Tate. 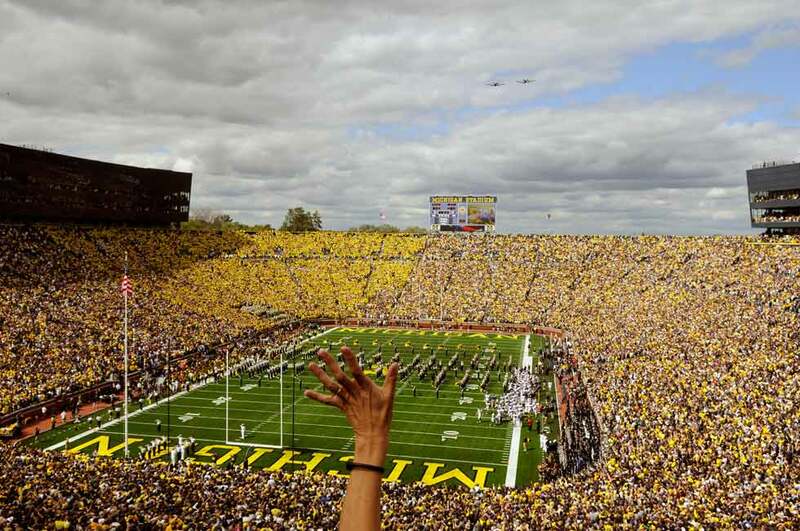 This school could easily become a hot bed for Michigan in the future. One of Michigan's recent defensive line commits, Poggi brings a lot with him to Ann Arbor. 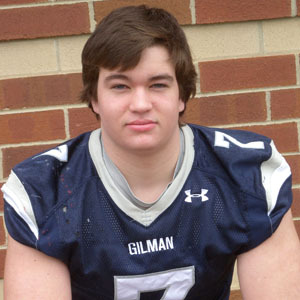 He is 6'4" and already weighs 270 lbs, which bodes well for early action in college. Michigan's 2012 defensive line recruiting class, although solid with players like Ondre Pipkins, doesn't have a ton of interior depth, so there is plenty of room for Poggi to get action early and often. Along with this talent, Poggi selected Michigan in a head-to-head recruiting battle over Alabama. Alabama has been at the top of the nation's recruiting for the last several years and has won two of the last three national championships. Beating them out for recruits, is difficult to say the least. 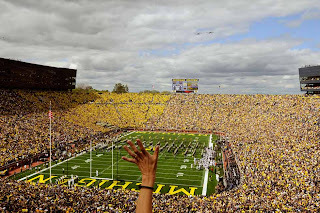 Yet Michigan and Hoke were able to accomplish this to bring a great player like Poggi to Ann Arbor. Don't let the rankings fool you; Patrick Kugler will be one of the best recruits to come out of this 2013 class for Michigan. I watched the first two highlights of his recruiting video, and he was pushing D-linemen 20 yards down the field, becoming an absolute stand-out on the football field. At 6'5", 280 pounds, Kugler creates lanes an express-way would be jealous of. He very powerful from the waist down and holds his own up top. All of these physical attributes to Kugler's game are very impressive, and he is going to be a dominant force on the line. However, what I value over that is his intensity on the field. Every time he flopped his defender 15-20 yards away from the line of scrimmage, he would let the other team know what he just did with fists in the air. Other Notable Offers: Florida, Florida State, Michigan State, Notre Dame. David Dawson is an in-state product out of Detroit at Class Tech that is playing tackle through high school, although he will be making the transition to Guard once he hits the college level with that thick body. Dawson brings the classic traits of run blocking and strength to an O-line class that is already looking very solid. At 300 pounds, Dawson will likely spend time putting on a little more weight before entering the college level. Other Notable Offers: Alabama, Arkansas, Baylor, Florida, Florida State, LSU, Missouri, Oklahoma State, USC, West Virginia. Ben Gedeon is a pure athlete out of Hudson High School in Hudson, Ohio. He is a 4-star recruit according to both Rivals and 247 Sports. 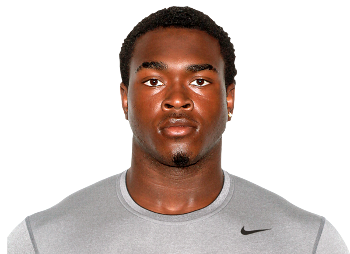 In high school, Gedeon plays mostly at the linebacker position and should be a nice fit in Ann Arbor. He ran for 1600 yards last season, which certainly implies that he has some amazing speed to complement his 6'3" and 215 lb stature. Rivals has him as the 237th and ESPN has him at 273rd in the nation so he's rated a bit higher here, which isn't too surprising seeing that 247 is usually a bit behind in their ratings. When 247Sports updates again, I wouldn't be surprised if Gedeon drops down a little bit. He won't be worse, there will just be a better understanding of the other players in the country. McCray is the final linebacker on the list, but fills out two classes that are insanely deep at linebacker. Look at Michigan's 2012 and 2013 recruiting classes and tell me those aren't great at linebacker. There is little doubt for me that McCray will be contributing to what will be one of the nation's best linebacker groups. Another nice aspect is that he's the son of a former Ohio State player, which makes it even more impressive that he ended up committing to Michigan. McCray is a classic sized LB at 6'3", 225 pounds, but he has the power to deliver hits that are anything but average. He will be a very nice tool to have for Greg Mattison because of his pure football instincts and the ability to drop back into coverage. 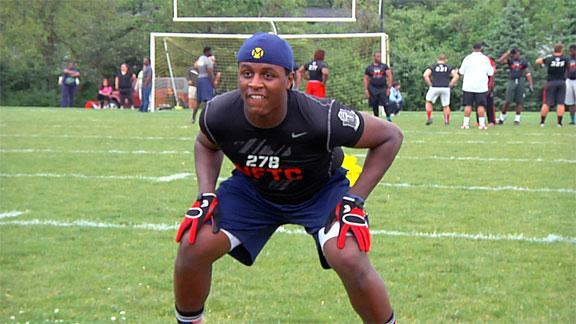 In my opinion, McCray is one the most underrated Wolverine recruits for the 2013 class. 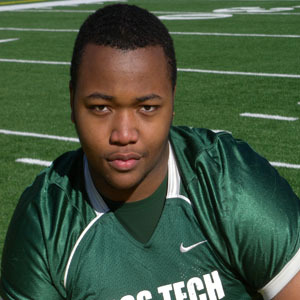 Other Notable Offers: Illinois, Nebraska, Ohio State, Oklahoma, Penn State, Virginia. With Michigan's recruiting developments at running back, Smith may become one of Michigan's most reliable backs in the future. ESPN and 247Sports have him at a 4* while Rivals has him at just a 3*, but he's a pretty talented player. He's a bit short at 5'11", but Michigan is pretty familar with short running backs that can make a tremendous impact on the game. He ranges from 20-32 at his position group, which is certainly a good sign, but the biggest question mark here regards whether or not Derrick Green or Jordan Wilkins commit to Michigan. If they commit, he will certainly have a chance at some play time, but those guys could easily be the starters early and often. Either way he's a solid player that should be exciting. This is one of those ratings that just leave a fan wondering about how these rankings are made. He's rated 64th in the nation by ESPN, but drops just short of 200 positions on this list. I realize that he is rated a 4* recruit on both sites, but dropping almost 200 spots, just doesn't make sense. Rivals has him as a 3* so 247Sports ranking will probably end up a bit more accurate, but this is certainly a odd ranking. Conley's greatest attribute to the Michigan defense will be his ability to defend one-on-one. He stands at 6'1", has very good instincts, and is exceptionally quick. Michigan did a very good job picking him up early; Conley will be rising on a lot of teams' recruiting boards. The next step of development for Conley will be developing his strength. Going one-on-one in the Big Ten will be much more difficult than in high school, and building up his body is one of the most important steps to take with this adaptation. Fuller is the kind of player that changes the entire dynamic of a recruiting class. Everything I've read leads me to believe he won't end up at Michigan, but the fact that he hasn't committed has to be a good sign, right? Most seem to think Clemson and Virginia Tech will battle it out for Fuller's talents. Either way, Fuller is an outstanding player. Rivals has him rated as the #3 player in the country and as an easy 5* recruit. ESPN has him a bit lower at a 4* and 28th in the country, but he is one of the elite players in the nation, without a doubt. If Michigan could pick him up, he probably would play early just because he's that good. He only stands at 5'11" and weighs 189 lbs, but ESPN cites his instincts and ball skills as major reasons for his high rankings. McQuay is another elite defensive player in the backfield. If Michigan misses out on Fuller, which is probably expected, they will have a chance with McQuay as well. With the recruits Michigan has gotten in recent years in the defensive backfield, neither of these guys are a "must get", but there's no doubt that they would do a ton to build this class. McQuay stands at an impressive 6'2" and weighs 185 lbs. He definitely has some great raw ability with a 32" vertical, a 4.5 in the 40, and a 4.35 in the shuttle. To me, he's not only the kind of safety that can shut down deep play ability, but he also should get a decent amount of turnovers, which can really change the entire dynamic of the game. Treadwell is the recruit that is most likely to end up in Ann Arbor that is not already committed. His is an outstanding wide receiver and would be, without a doubt, the best wide receiver in Michigan's 2013 recruiting class, and probably well beyond that as well. Will he fulfill his potential? That's a question that is fair for just about every recruit, but I certainly think he can fullfill that challenge. Michigan has been cited as his leader, but it should be a long battle since Treadwell wants to enjoy the process. The one school that seems to be desperately trying to take a run at him is USC. Since Michigan has already lost Ty Isaac to USC, it would be a major letdown to lose Treadwell to them as well. Regardless, keep an eye on Treadwell since there's a great chance he ends up at Michigan. Green is another recruit that seems to have some drastic differences in ratings. Green is rated as a 5* recruit by Rivals and as the #1 running back in the country, but falls much lower here. Michigan appears to have a decent chance here, but it will be a tough battle as he has only narrowed his list to twelve at this point. Standing at 6'0" and weighing 218 lbs, he is the perfect fit for a pro-style offense. He would be an outstanding fit in what Michigan's offense will become in the near future. I think he could easily become an elite back if placed in the right situation, which is one of the main reasons he is so deliberate in his recruiting process. The big question is just about where he will eventually attend college. Wilkins has a lot of similarities to McQuay on this list. If Michigan misses out on Green, similar to Fuller, they can go after Wilkins. 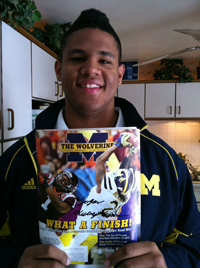 The only difference is that I find it very doubtful that we will ever see Wilkins wear the Maize and Blue. To me, he will end up in Auburn in 2013 and I actually considered removing him from Mcihigan's 2014 targets list and this list. 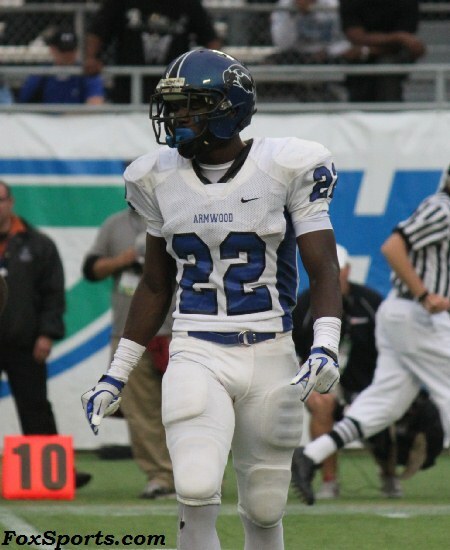 He's an outstanding running back like Green and would be a fantastic fit in any pro-style offense at 6'1" and 212 lbs. Am I the only one that's shocked not to see Jourdan Lewis on the list? He has been absolutely killin it on both sides of the ball throughout the camp circuit and has shut down elite wr's such as Laquon. Part of the issue with players like Gedeon and Conley are not that they are accurately or inaccurately ranked, it's that they aren't really doing the camp scene, which really hurts their rankings with some of the recruiting services. Largely, I think it's that they just don't know about them. They could be better or worse than where these sites have them ranked. I personally think Shane is being underrated somewhat. His accuracy has pretty much been spot-on since the Dallas Elite-11. He's a better athlete than Max Brown IMO, and he's so much better of a passer than Tyrone Swoops, who has major mechanical issues. I can see why Browne is ranked ahead of him because he seems further along in his development (keeps his feet chopping, keeps his eyes down-field at all times, handles pressure exceptionally), but his upside is so much higher. I think Browne could be a lot like Barkley in the fact that he'll produce very well in college, but will be limited in the NFL because of average arm strength. I'm not sure exactly how I feel about Green. The kid is a freak athlete. I've heard rumors that he runs a 4.37 40, and he runs like a freight train. He reminds me a lot of Va Tech's David Wilson, who was just drafted by the NY Giants in the 1st round of this year's draft. He displays elite speed and strength, great agility, but I do question his instincts and vision. With Michigan's O-line class this year and last, he would be absolutely devastating against safeties and corners. I might actually prefer Wilkins to Green, but from what I've read, it's all but a foregone conclusion that he's going to Auburn. I believe 247 underrates Treadwell. In fact, if the various camps, 7-on-7s etc. are any indication, I think he might be the best WR in the country. I think he's easily a top 35 recruit, and probably top 25. He could be a little faster, but his speed is still very good and certainly not a weakness. He's got great body control, great ball skills, and he's big and physical. He's exactly what Michigan's looking for.